The Multimedia Education Center is a mobile-first newsroom designed for mobile-first journalism. Everything within the lab is mobile, with walls on wheels and furniture that can be easily moved. Too often newsrooms consist of "wooden desks with a computer, mouse and keyboard, and a printer in the corner," Robb Montgomery, a journalist who worked on developing the lab, told Journalism.co.uk. 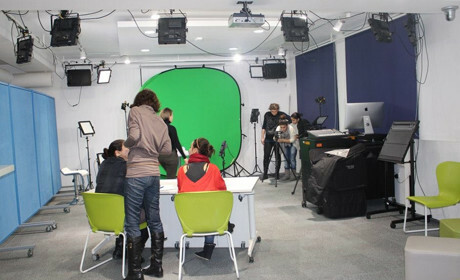 The newsroom, also known as the SMART Media Lab, is, perhaps surprisingly, located in Tbilisi, Georgia. It serves Radio Free Europe and Radio Liberty as well as two journalism schools and student media. "We talk a lot about mobile-first journalism but we are still talking about the consumer end of things, another bucket to put our stories into rather than how we are producing the stories," Montgomery, a former editor at the Chicago Sun-Times and Chicago Tribune who now lives in Berlin, said. "The idea of mobile was so much more than 'let's give a smartphone to everyone', we were working with the DNA of what mobile might mean." He added: "We felt we needed an environment that was mobile almost to the extreme," he added. 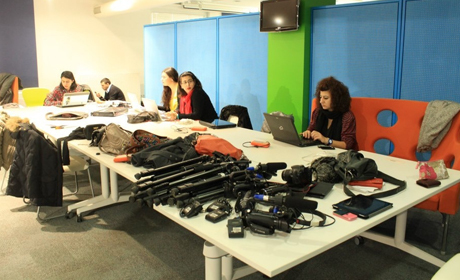 So why is this mobile-first newsroom in Georgia, in the South Caucasus? "It's in a place you might least expect it but in a place where it is most needed," Montgomery told Journalism.co.uk, explaining that it was funded by USAID, the US Agency for International Development, and built by IREX, A US-based nonprofit focusing on international education. And what did it cost? "It really was not so expensive," Montgomery said. "It was less than $1 million, and supports three schools that had no media lab capabilities." Work on designing the lab got underway three years ago and it opened in March 2012. 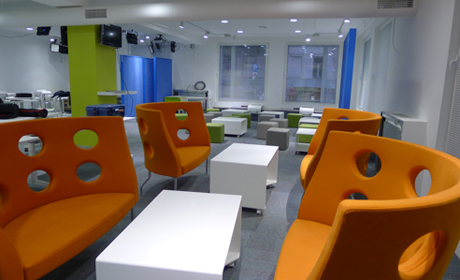 Montgomery was keen to create a space suited to the "next generation of journalists", but as the area is only 400 square metres, it required "a radical mobile design concept". "We had to show them the ideas that we couldn't just tell them," Montgomery said, explaining how they created their pitch presentations on mobile devices. The three "legs of the tripod" that support the multipurpose, multimedia lab are apps, training and development, he said. Journalism.co.uk first met Montgomery at Digital Journalism Days, an event in Poland last month. He presented at the conference, sharing tips for mobile journalism kit. Images courtesy of Robb Montgomery.